A practical and smart amplifier that won't give any nasty surprises. The 8000A lives on! The revived Audiolab name has also seen a revival of some familiar-looking model names, but the most famous of those, the 8000A, is replaced by the 8000S. 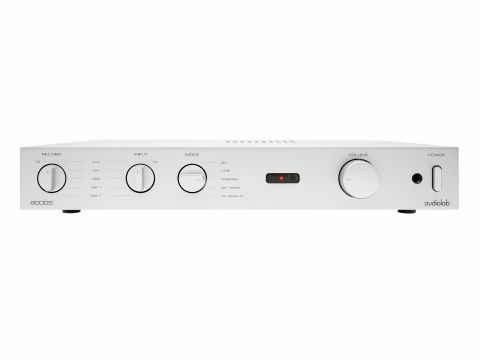 The new model is basically a fully traditional integrated amplifier in almost every respect: unlike the old 8000A, it doesn't have a phono stage and it includes remote control. But otherwise, the similarities far outweigh the differences. Thanks in part to the economies of offshore manufacturing, the case is a deluxe affair with an aluminium extrusion for the front panel, while the rest is steel, the top of which is mechanically damped to prevent ringing. Inside, a single circuit board carries all the components. In keeping with the traditionalist theme, almost all the stages are based on discrete transistors - we spotted just one (good quality) op-amp. Of course, the output transistors (a single pair per channel of large high-speed bipolar types) are mounted on a heatsink. Audiolab has used heatsinking on a number of other components, several of which are also thermally linked together, presumably to maintain matching of characteristics between pairs. This kind of attention to detail can help make an amp more consistent with time and temperature. The 8000S has separate source switches for listening and recording, a rare feature but one we like. Both are good old-fashioned rotary switches, but the 'listen' one is motorised and hence remote-controllable, and in fact operates relays at the rear of the unit. The volume control is likewise a motorised mechanical part. Unlike the old 8000A, our listeners seemed to find plenty of common ground in describing the 8000S. They all seemed to find its performance dependent on the music playing, with the most successful tracks being those featuring quite small groups of musicians. The Penguin Cafe Orchestra track (which we've found a useful arbiter precisely because it's a good but not great recording) 'timed' very well and sounded generally lively and energetic. Spatially, it was closed in, but there was still plenty of air around the sound and all the instrumental lines were easy to follow. Similar comments were made about the baroque chamber piece; vague in imaging, but tonally precise and rhythmically taut, too. There was praise here for the bass, which helped present the full-bodied sound of the harpsichord and cello. Larger, more complex works drew a mixed reaction. Michael Jackson's dense backing was lacking depth and insight. All the same, the midrange agility and extended bass of the amp again made things clear tonally and melodically. Much the same held true in the opera track, where all agreed there was a nice flow to the track but limited soundstaging detail. It was also felt here that dynamics rather lagged the best around. Our own sighted listening to this amp confirmed that it is talented tonally, but less confident in imaging and fine detail. All the same, it passes the long-term listening test very well, with little or no 'listener fatigue' and keeps the listener's attention without intruding. It's cheap, but it far from disgraced itself and, scoring highly for practicality, clearly merits attention.